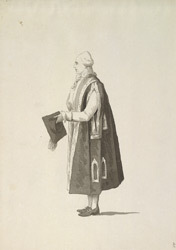 A drawing in ink depicting Oxford University dress, by S.H. Grimm. Detailed rules governed what members of the university should wear, and it is possible to recognize the degrees held by graduates and the social rank or status of undergraduates by their robes. The figure shown here is a Nobleman undergraduate, a peer or son of a peer, in his full-dress gown, which is worn at gatherings of a formal or ceremonial character. It is made of coloured silk brocade (usually blue or purple) and is richly decorated with gold braid down the facings, round the armholes and the square flap collar, and in panels on the sleeves and the skirt of the gown. The mortarboard is covered in black velvet and has a gold tassel.